Les Euros – How is it for You? So, the Euros then…On the plus side, two footy matches every night on the tellybox can’t be a bad thing! (Although Mrs UTD has, at this point in time, stopped speaking to me, as it were) …Staying with positives, I can’t think of a game yet that I haven’t enjoyed watching. I’ve watched them all, and I’ll watch all of the rest. It’s a great warm up act before Maria Sharapova graces our screens once again when Wimbledon starts – and of course, there’s the women’s beach volleyball at London’s Olympics to look forward to – but I digress! Imagine you’re 67 years old, and the Club you’ve supported all of your life, your home town club, offers you bucket loads of cash, plus expenses, to travel abroad and watch football – lots of football. Stay in nice hotels, eat at the finest restaurants – but best of all, watch loads and loads of football. A dream for most fans, but it just came true for arguably one of the biggest United fans of them all – Graham Carr, superscout! And of course when you’re not away on United business, you can watch the mighty Magpies – without having to buy a seasons ticket! 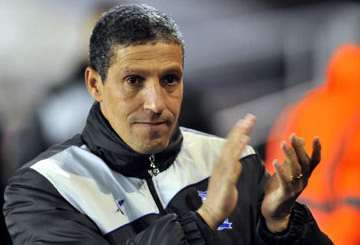 Chris Hughton for Norwich City? A Geordie View! Today’s Independent newspaper is reporting that Chris Hughton is in talks with Norwich about their managerial vacancy, following the defection of Paul Lambert to Aston Villa. At one stage it was thought that Chris was in the running for the West Bromwich Albion job, but that all cooled down and it looks like Norwich could now be his destination. This could be a really good move for Chris, who has once again proven himself to be a good manager by taking Birmingham to last season’s playoffs on a shoestring budget due to limited resources. Birmingham’s financial problems are well known, and Norwich must be a better opportunity for him. And of course, the catering is better at Norwich given that Delia Smith makes all the pies personally, erm allegedly! ;-) He would also be taking over a good, competent squad left behind by one of the English Premier League’s up and coming managers. And to be fair, he currently fits into that category comfortably himself. First the good news – Papiss Demba Cisse wants to stay at Newcastle United for “many years”. And what’s more, that news is actually backed up with direct quotes from the player speaking to Sky Sports. So this isn’t “a source close to the player” or “a source close to the club”, this is Cisse himself, on the record, saying he wants to stay. Now that the Newcastle Evening Chronicle has had it’s “Mike Ashley is a lovable cuddly owner and doesn’t eat babies after all” week, and everybody swallowed it (aye right!) 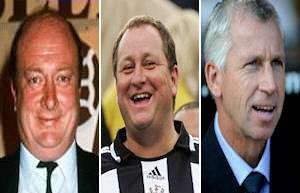 I suppose it’s safe to have the odd Mike Ashley story on this venerable blog? Woah! Who hoyed that rotten tomato?? Mikey’s company, S_____ D_____ (hereafter referred to as “SD” or there’ll be lines all over the place!) is reported by The Scotsman to be in the hunt to buy the Umbro brand – wot makes the kit for the Ingerland team. The brand is currently owned by US Company, Nike (the one with the big “tick”), who bought it for £285M in 2008.